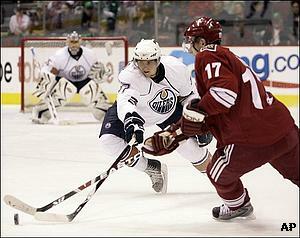 GLENDALE, Ariz. (AP) -Dwayne Roloson showed few signs of rust in his first start in six weeks. Roloson made 38 saves to lead the Edmonton Oilers past the Phoenix Coyotes 5-2 on Saturday night for their fourth win in five games. "I was just trying to focus on the things I had to do," Roloson said. "I made a few mistakes, but was able to get away with them." Roloson hadn't started since Feb. 1, and hadn't won since Jan. 20. "Roly was outstanding," Oilers coach Craig MacTavish said. "Just to see him handling the puck, batting the puck, flipping the puck out, you can tell he had a high confidence level." Ales Hemsky, Joni Pitkanen, Kyle Brodziak, Marty Reasoner and Fernando Pisani all scored for the Oilers, who won the first three meetings between the teams this season. Shane Doan and Mathias Tjarnqvist scored for the Coyotes, who fell three points behind Nashville for ninth place in the Western Conference standings. Phoenix is five points behind Vancouver and Calgary for the conference's final two playoff spots. The Coyotes play Vancouver on Monday. "This was the biggest game of the year for us and we got outplayed," Coyotes coach Wayne Gretzky said. "We got beat to loose pucks, they had a little more discipline than we did as a team and they just played a much better hockey game. It's as simple as that." After the game, the Coyotes held a 15-minute players-only meeting. "It's hard to put your finger on it," Doan said. "We've got 10 games to go and we're not out of it yet. We just made it that much harder. We had to win in Vancouver anyway. I'm not saying this wasn't big because it was. But we had to win anyway." The Oilers took advantage of a mental error by Phoenix goalie Ilya Bryzgalov to take a 2-1 lead at 7:45 of the second period. Bryzgalov left the crease to help cover Edmonton's Robert Nilsson as the center skated to the left of the crease. But Nilsson passed behind Bryzgalov into the crease, where Pitkanen scored into the vacated net. "I think we played a great 60 minutes, every guy on the team," Nilsson said. "The goalie played good, the defense played good, we didn't have any turnovers and every line scored." Brodziak made it 3-1 at 15:14 of the second when he deflected Zack Stortini's shot from the right faceoff circle past Bryzgalov. Curtis Glencross set up the goal by stealing the puck from Phoenix's Nick Boynton behind the Coyotes net, then skating out and passing to Stortini. "We knew going in it was going to be one of those games where both teams are coming out hard," Brodziak said. "We did a good job of not getting into too much trouble and not spending a lot of time in our own zone." Reasoner added a goal off a rebound in the low slot to make it 4-1 at 8:19 of the third. Tjarnqvist cut the lead to 5-2 at 18:48 of the third when his shot deflected off the skate of Oilers defenseman Ladislav Smid. But Pisani scored into an empty net 19 seconds later for the three-goal lead. "It was a complete effort in Colorado (a 5-1 loss Thursday) and it was a complete effort tonight from polar opposites of the spectrum," MacTavish said. Hemsky opened the scoring at 6:17 of the first period with a power-play goal on a wrist shot from the right faceoff circle. Doan tied it at 4:03 of the second period, deflecting Martin Hanzal's shot from the outside edge of the right faceoff circle past Roloson. Notes: Roloson's rare start ended Mathieu Garon's streak of 17 consecutive starts three shy of the franchise record of 20. ... The Coyotes fell to 16-18-3 at home, the second-worst record in the league. Only Los Angeles with 33 points has a worse mark than Phoenix's 35. ... The Coyotes completed a five-game homestand in which they faced four of the league's six Canadian teams. ... The Oilers have 17 power-play goals in their last 18 games.